Aiseesoft DVD to iPad Converter for Mac is the best DVD to iPad Converter software designed for Mac users. With it, you can rip any DVD movie to iPad MPEG-4, H.264/MPEG-4 AVC, MOV, M4V, ect video formats and AAC, MP3, WAV, AIFF, M4A, etc audio formats. Also it allows you to rip DVD to iPad on Mac with different resolution, you can select subtitle and audio track, trim DVD clips, crop and watermark the video, even adjust output effect. Rip any DVD to all popular video and audio formats supported by iPad on Mac. ...... Deinterlacing feature, and so on. Rip DVD to iPad MPEG-4, H.264/MPEG-4 AVC, MOV, M4V video and AAC, MP3, WAV, AIFF, M4A audio formats. The converted files can be perfectly played on iPad, iPod touch, iPod touch 2, iPod nano, iPod nano 4, iPod classic, iPhone, iPhone 3G, iPhone 3GS, iPhone 4, Apple TV, etc. Drag the frame to choose your suitable play region and remove black edges. You can also select "Zoom Mode" according to your preference. This Mac DVD to iPad Converter can run on computers with either Power PC or Intel processors. It is perfectly compatible with Mac OS X Leopard, Tiger and Snow Leopard. 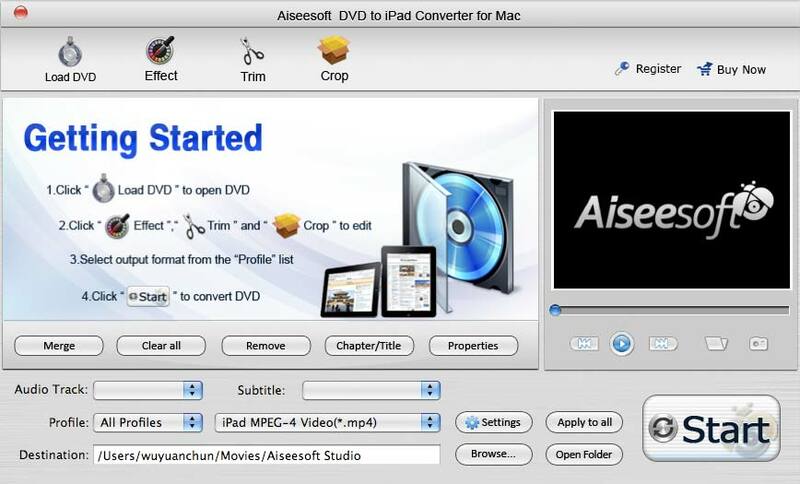 Qweas is providing links to Aiseesoft DVD to iPad Converter for Mac 6.3.20 as a courtesy, and makes no representations regarding Aiseesoft DVD to iPad Converter for Mac or any other applications or any information related thereto. Any questions, complaints or claims regarding this application Aiseesoft DVD to iPad Converter for Mac 6.3.20 must be directed to the appropriate software vendor. You may click the publisher link of Aiseesoft DVD to iPad Converter for Mac on the top of this page to get more details about the vendor.